The city of s'Hertogenbosch in 1540, after the Gothic reconstruction of Sint Jans Church had been completed. The fairgrounds were on the meadow in the foreground to the left. The river Dommel fed the moats of town, and the road leads to Vught. The inn of ill repute is barely visible in the right-hand corner. The three friends in 1467-68. Jacob van Almaengien (28) is pointing at Sibylle. 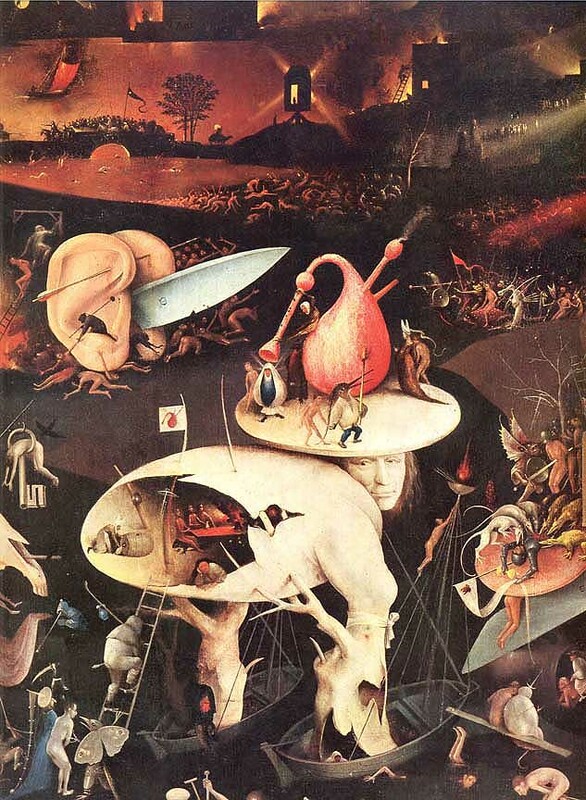 Jeroen van Aken, aka Hieronymus Bosch is hiding in the back of the cave. 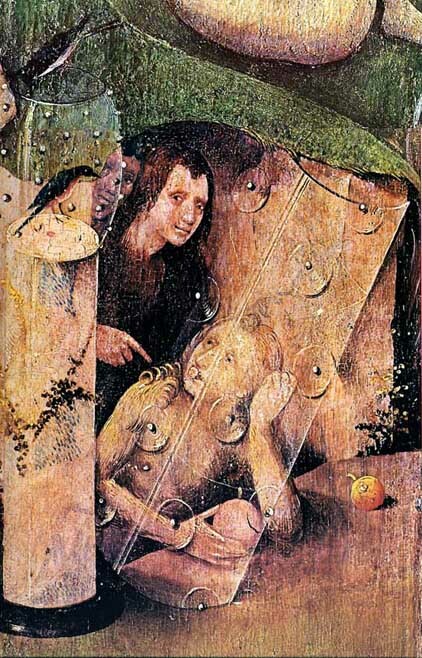 He was 18 when he began painting the Garden Triptych in 1468 with the help of Sibylle and Jacob. Fragment of a Last Judgment, 64 X 114 cm, ~1467 (?) , Alte Pinakothek, München. Temptation of St. Anthony, 70 x 50 cm, 1467/68, Prado, Madrid. 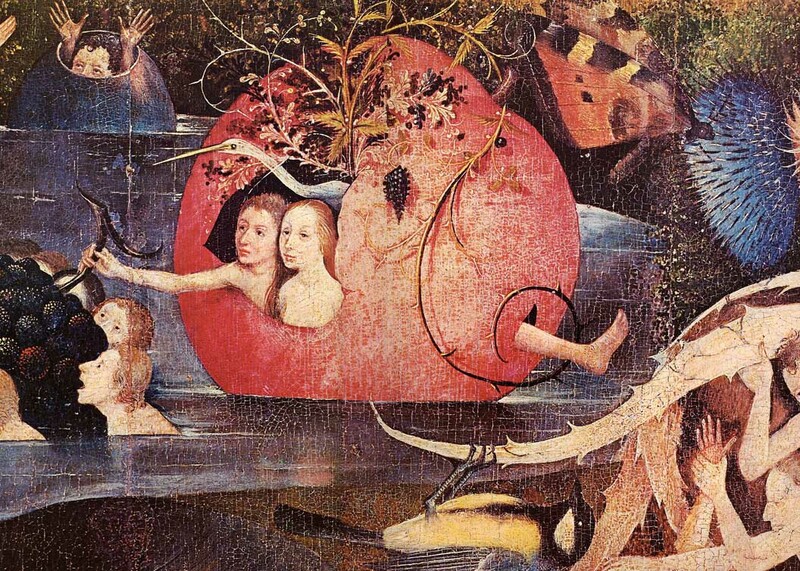 Painted before the Garden Triptych it is now considered Bosch's first painting. 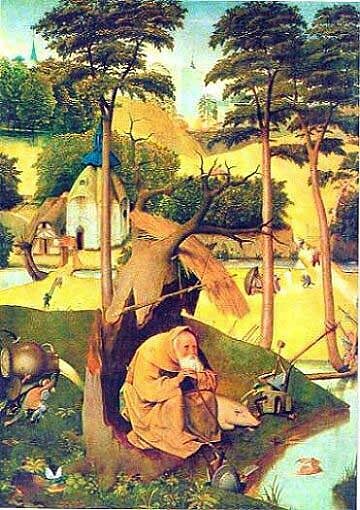 It is fondly known to some people as "St. Anthony in Central Park," because of the futuristic New Jerusalem in the background. 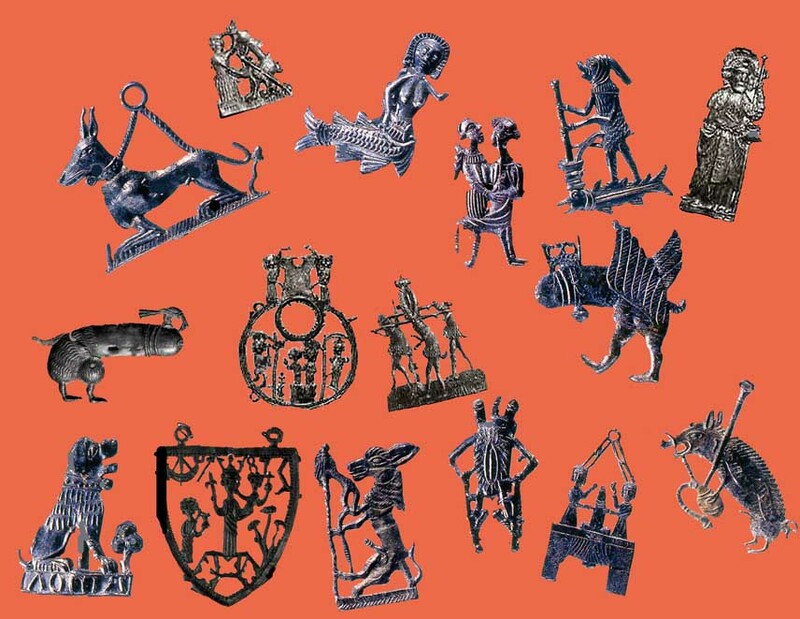 Sibylle's table of "pilgrims' badges," sacred and profane pewter amulets she had cast in Vught and sold to the visitors to the Den Bosch fairs. The Theft of the Golden Fleece is found in the center. They were very popular. Hundreds of these amulets have recently been unearthed in Hertogenbosch by "urban" archeologists. 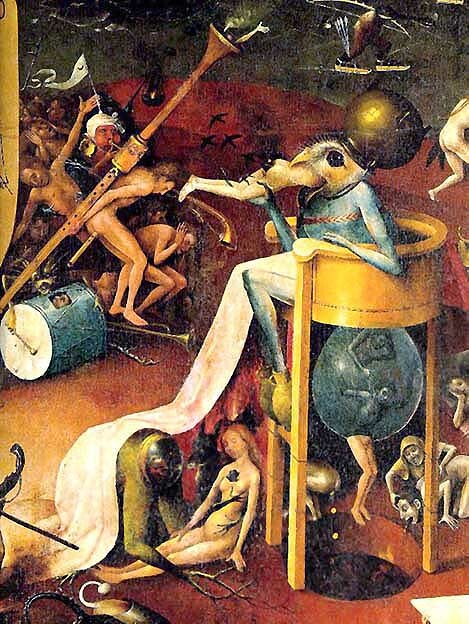 They put Bosch's weird creatures into context. 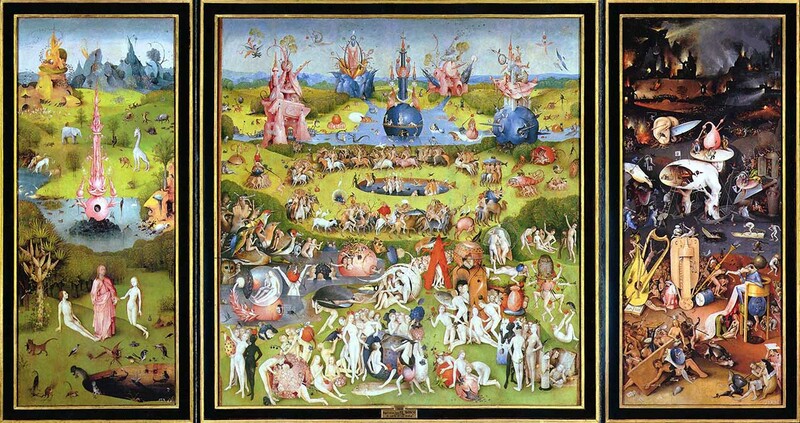 The Garden of Earthly Delights Triptych, 195 x 220 cm, 1467-70, Prado, Madrid. The Garden Triptych has now been dendrochronologically dated to 1458, Prof. P. Klein's earliest date for the felling of the tree for the planks of the panels. If one adds 9 years, the time Bosch usually dried and cured his oak boards, Bosch could have begun his most famous painting in 1467-68 when he was 18! 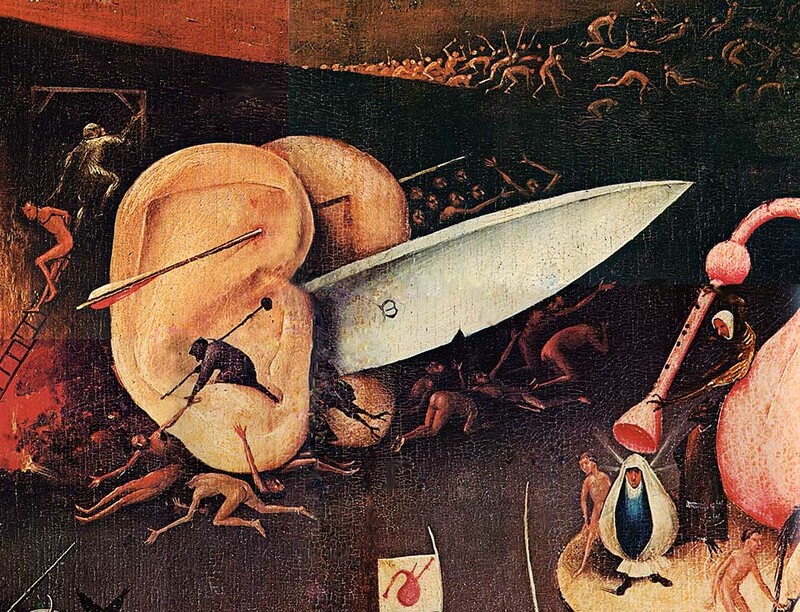 Considering its erudite content, this startling discovery necessitates a renewed, careful examination of the origins of Bosch's intellectual resources. It appears unavoidable to assume that he, like Dieric Bouts the Elder in 1464-67, had a learned, Hebrew-speaking advisor. 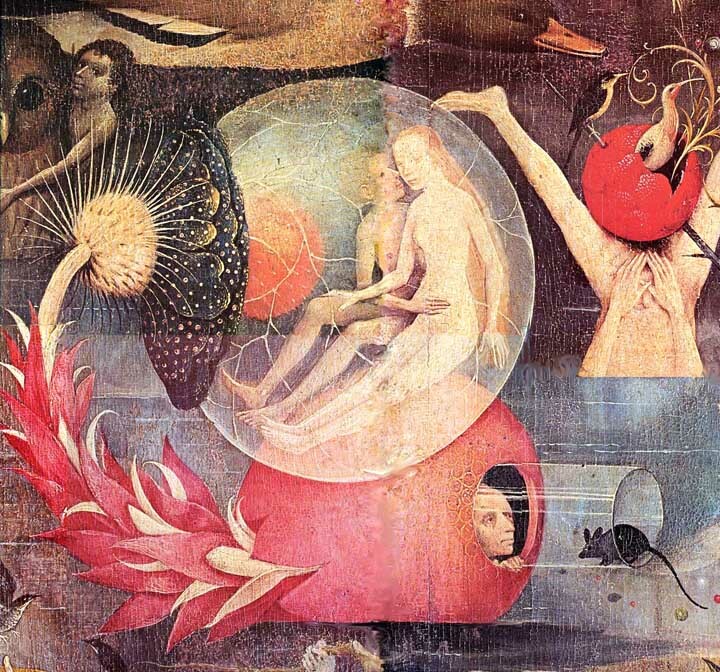 The question of Bosch's advisor is the subject of the novel. 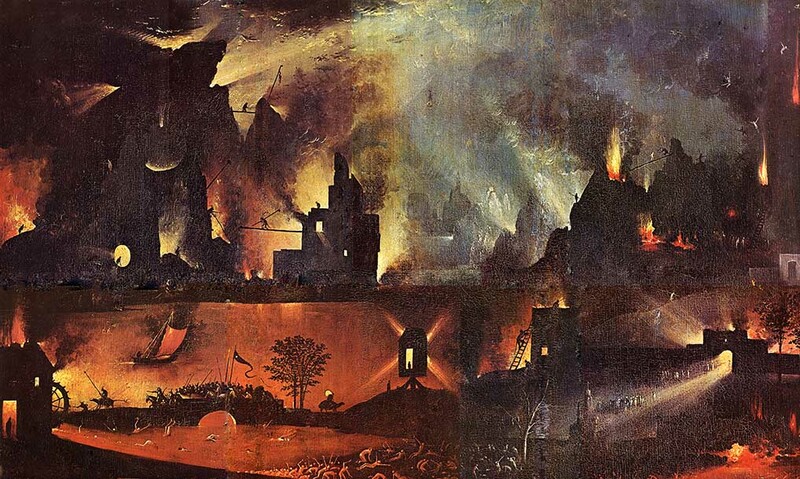 Some of the technical and historical consequences are described in a postscript Reading Bosch's Paintings. 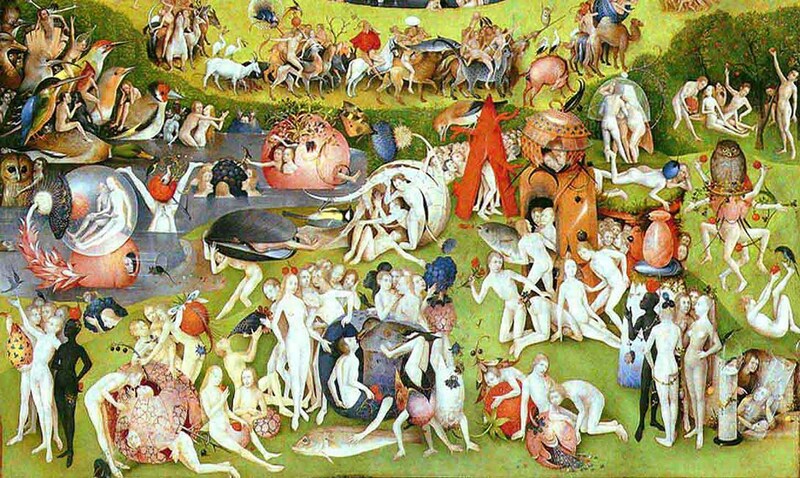 The Garden of Earthly Delights Triptych, Right Wing, 195 x 110 cm, 1467-68, Prado, Madrid. The Garden Triptych, Right Wing, Terra Nostra, 1467-68. The burning city. An apocalyptic prophecy of the World-War-II conflagrations of such cities as Dresden, Hamburg, and Berlin. The Garden Triptych, Right Wing, Terra Nostra, 1467-68. The ears cut by the knife with the nick. An acupuncture arrow spikes the ears together at one libido point and a black devil excites another. A knife with the same hallmark of a neighboring knife-smith and the same nick was found in a dump near Bosch's house by the urban archeologists! According to Ficino's theory, by practicing "Rational Platonic Love" the soul rises through three spheres to a Pythagorean Heaven of Perfection above which God reign's supreme. 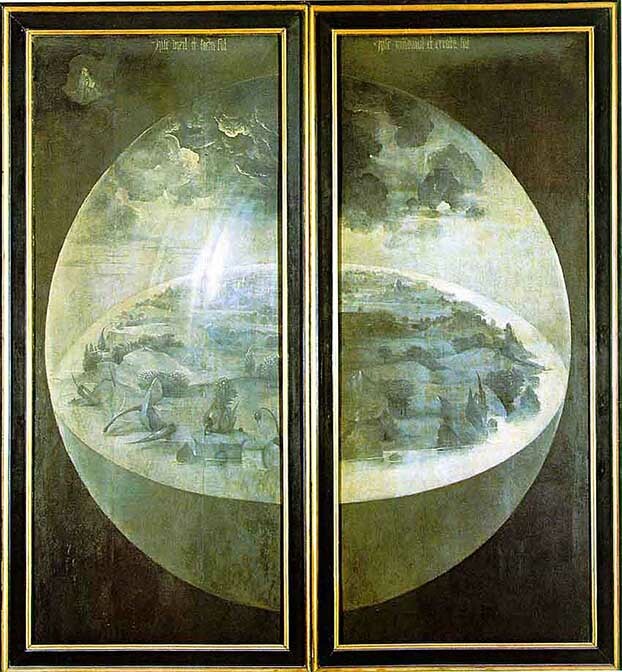 In the middle panel of the Garden only two of Ficino's spheres are shown: the Garden of Love and the Heaven of Pythagoras. Bosch omitted the Christian God on Jacob's request, and inserted a Wedding Cavalcade to celebrate Sibylle's and Jacob's Wedding. The Garden Triptych, Middle panel, Variations on "Rational" Love and Death. 1469-70. 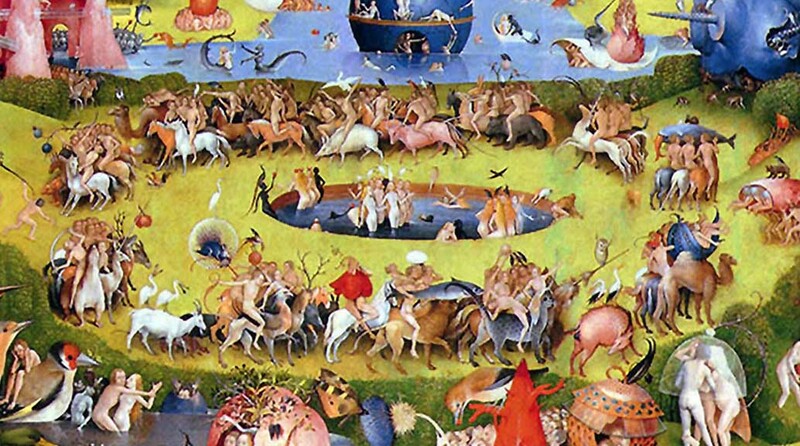 On Jacob's wish Bosch introduced the death scenes into Ficino's vision. Guided by Sibylle's intuition, Death is female. 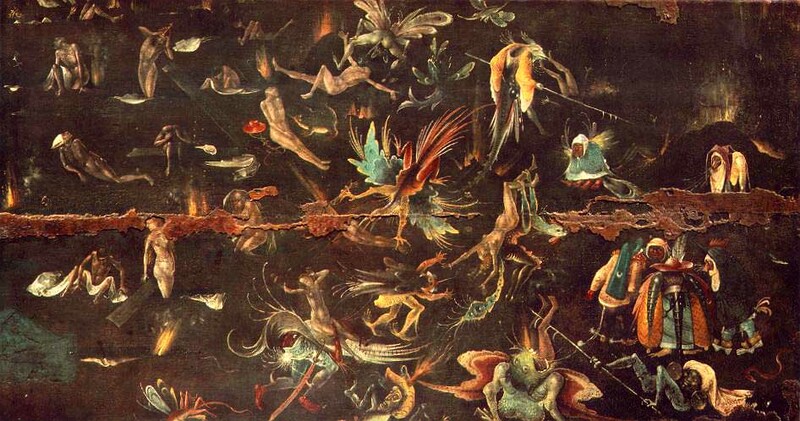 Sibylle suggested the inclusion of the flock of birds in this panel. They derive from a Persian Sufi-poem by Farid ud-Din Attar which describes the same quest as Ficino's. The movement in the middle panel is from right to left. A separate front-garden connects to Terra Nostra. The three authors appear in the cave in the lower, right-hand corner. The Garden Triptych, Middle panel, The Wedding Cavalcade, 1469-70. 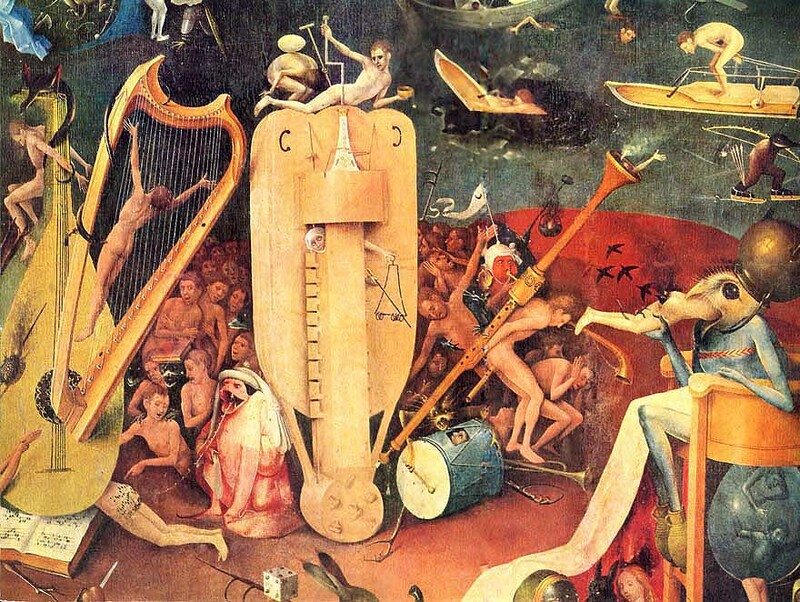 This cavalcade must have been Bosch's idea. It has no place in Ficino's plan. The bridal pair, hidden under the petals of a red sweet pea rides in the foreground on a white horse. Every rider and all animals are male! The girls are watching from the circular pool beset by a flock of soul birds. 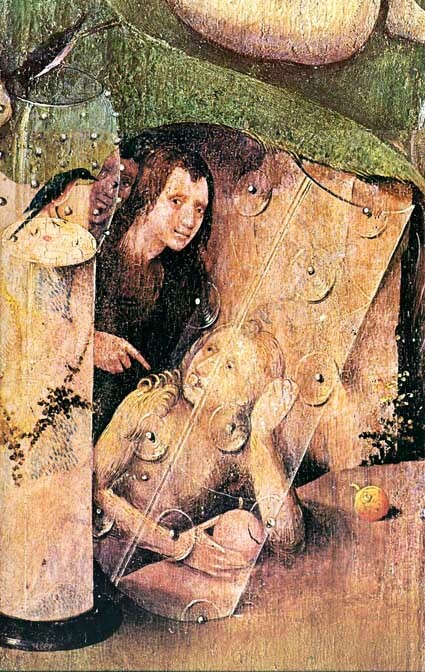 Sibylle, two cherries on her head, personifies death. A Barberry duck, who is voiceless, drops a red pill or fruit into the mouth of a man sitting in the dark opening of a colorful barrel. Two women, partly transformed into their soul birds, try the perfect Pythagorean handstand. The share an odd number of arms between them. For want of a better hallucinogen I assumed that the little red pill contains opium, which was locally available at the time. Whatever psychotropic this is undoubtedly a "drug" scene. The Garden Triptych, Middle panel, The Arrival of the Birds, 1469-70. Lead by the Hoopoe Attar's birds, after a long march through the Seven Valleys of Depravation, are about to realize that the Simurgh is but an image of their soul and dissolve themselves into the Ocean of Love. The Garden Triptych, Middle panel, The Lovers in the Pomegranate, 1469-70. Floating on water in the large fruit Jeroen and Sibylle are forever united.. The Garden Triptych, Middle panel, The Lovers in a Seed Pod, 1469-70. Another tender-loving pair occupies a large amniotic seed pod, or are they also Jeroen and Sibylle? An elderly guardian is distracted from watching them by a mouse approaching through a glass cylinder. The Garden Triptych, Middle panel, The Trio in the Cave, 1469-70. In a cave in the lower right corner of the Middle Panel, in a place where the painter would usually put his signature, Bosch has immortalized the three authors of the triptych: Jeroen is hiding in the dark background and prominently, Jacob fully dressed pointing at Sibylle. She is the keeper of the female secrets of the Garden. Her mouth is sealed. Knobs in the glass cylinder which surrounds her cover her right breast, her conjugal vein, and the pulse at her right wrist. A pair of her soul birds is enshrined in a second glass cylinder. Behind her, hard to see in this reproduction, sits attentively Jacob's dog who accompanied him on all his peregrinations. 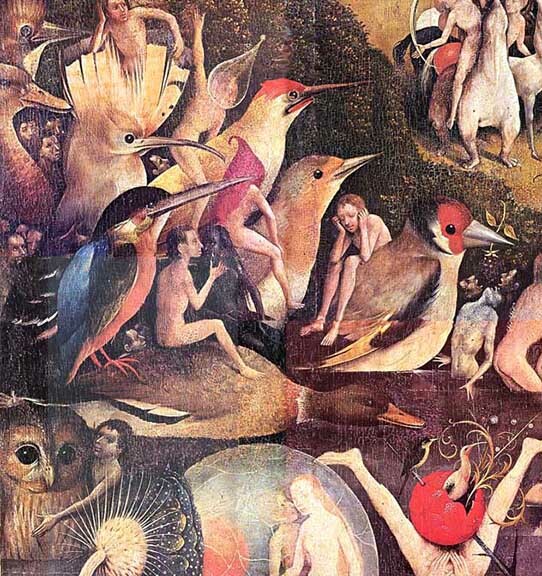 On Jacob's wish Bosch overpainted the animal. The Garden Triptych, Left Wing, The Hieros Gamos of the New Covenant, 1469-70. 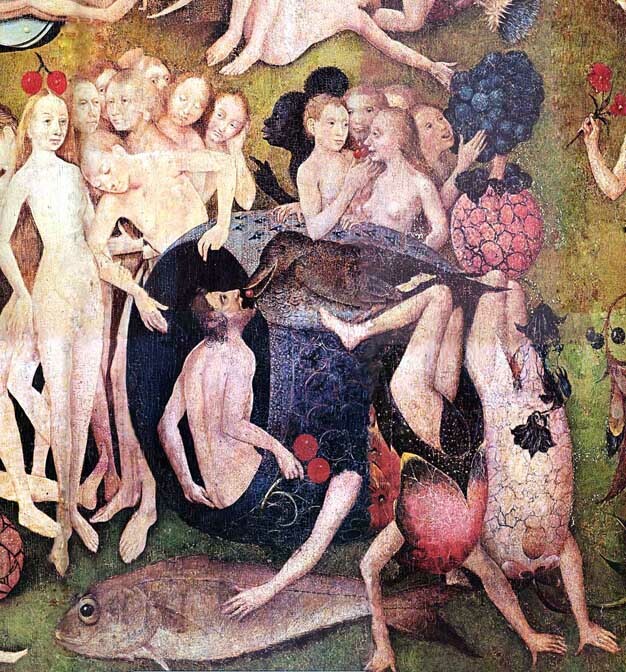 In the Left Wing, under the deceptive guise of a conventional "Creation of Eve," Bosch painted the Hieros Gamos of the New Covenant, the sacred Betrothal of Jacob and Sibylle through Christ. This is definitely not the paradise of Genesis! Here the original sin of knowing female wisdom is redeemed by Christ's love. The lovers will not be driven from paradise by Jaweh's wrath. Bosch leaves no doubt that this is not the scene of Genesis: the snake and the tree of temptation, a palm tree, the tree of knowledge in Islamic symbolism(! ), is banned to the far edge of the panel. An exotic Joshua tree without fruit prominently rises in the foreground. To startle the beholder further into understanding this joyous transformation and to remove any remaining misconception, hybrid Boschian critters emerge from a dark cesspool in the foreground to devour each other. 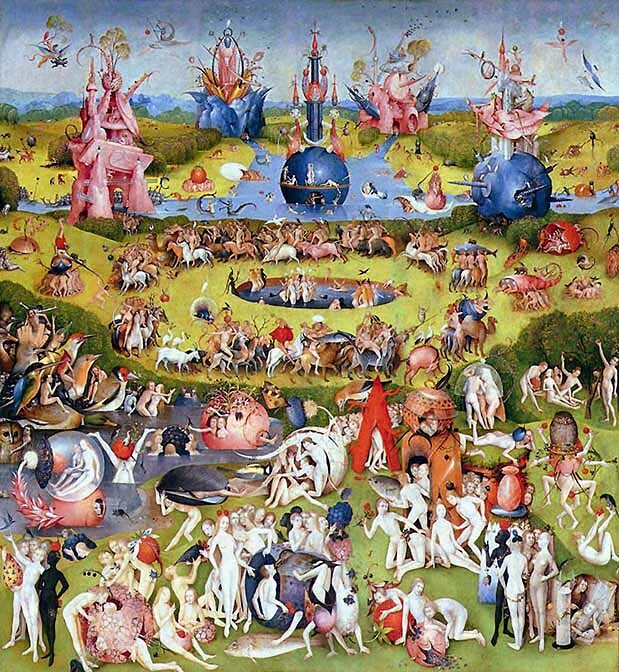 On a mound of blue crystals Bosch raised a pink dimorphic Fountain of Life. Next to Jacob sits a magpie, Jacob's soul bird, which as in many other Bosch paintings accompanies and identifies Bosch's friend and mentor. The Garden Triptych, Left Wing, The Betrothal of Jacob and Sibylle by Christ (enlarged), 1469-70. The Garden Triptych, (closed), Outside, The Third Day of Creation, 1469-70. 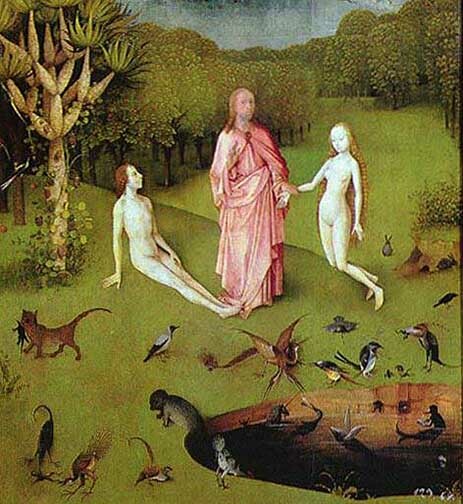 Unless closely examined this deliberately old-fashioned depiction of the Third Day of Creation appears innocuous. The earth, a circular disk, floats in a crystal sphere. Mists rise from the earth to form the first clouds. Soon rain will fertilize the planet. The two inscriptions say: on the left, Ipse dixit et facta sunt, and Ipse mandavit et creata sunt on the right panel. "He spoke and it was done," and "He commanded and they were created." To the surprise of the reader these obscure but apt quotations were taken from the Psalms of David (33.9 and 148.5) and not from Genesis! To soften this startling affront, a tiny God Father has probably been painted in by a later owner. In a textural examination of the painting Wilhelm Fraenger observed that in the then available Latin translation of Genesis fountains (fonts) spring from the earth on the third day instead of mists (red) in the Hebrew original. In Bosch's time Luther's translation of the Hebrew Bible was not yet available. From this observation Fraenger concluded that a Hebrew-speaking scholar must have advised Bosch! He later suggested that Jacob van Almaengien was the wanted Bosch mentor.